The number of 2007-later performance engines is increasing. But Nightrider.com still recommends staying with fairly conservative upgrades. We are only listing a few bolt-in cams right now that meet the performance needs for all but the most radical of engine builds. Please be aware that complete exhaust systems and cam shafts are very specific to all 2007-later 96/110 CID engines and 2006 Dyna models. Exhaust systems for these bikes have bungs installed in them for the O2 sensors required to maintain EPA compliance. While any exhaust system can have O2 bungs welded into them, placement of these bungs is important and the chrome will be damaged when welding in a bung. We will continue to expand the recommended engine upgrades section as more parts become available for the 2007-later bikes. It seems that many riders believe that using Screamin' Eagle performance upgrades have no effect on their HD Warranty. Despite what the local HD Dealer may tell them, only HD parts that are listed in the 2007 Catalog with a "green light" designation can be installed on their bikes without having a negative effect on the warranty. This means that most Screamin' Eagle components will void the warranty on much of the engine. While in some cases your local HD Dealer can "sneak" a warranty issue through Harley's process as a courtesy to its own customers, it is highly unlikely that another Dealer will extend the same courtesy. No matter what your local Dealer may tell you, the explanation of the warranty listed above is an honest interpretation of how Harley-Davidson is now enforcing its warranty. The chart below lists recommend parts for upgrades that can be performed to your 2007/2008 Harley-Davidson. While the list is not all inclusive, it does contain a list of parts that Nightrider has extreme confidence in. These parts and suppliers have historically provided the type of components and upgrades that have above average performance. For serious performance work on the 2007 and later bikes, the first thing that should be done to the bikes is alter the final drive ratio by installing a 30 tooth transmission driver. A second recommendation is to add the 70 tooth rear driver from 2006 earlier twin cam engines. The change in final drive ratio is required to allow the engine to turn enough RPM's to take advantage of the power a modified engine can make. Without the final drive upgrades, the dyno sheet might be impressive, but the OEM gearing is not compatible with a performance engine. So unless you are willing to invest in the upgraded gearing, we highly recommend you leave your engine as stock as possible. There are many good exhaust system upgrades, however we have chosen to list the systems we know produce above average power. These are systems that we would use as "reference" performance when dyno testing other pipes. True Duals. There is a wide performance difference between Manufacturers of true dual exhaust headers. Some of the pipes work quite well, but many perform worse than the OEM header. 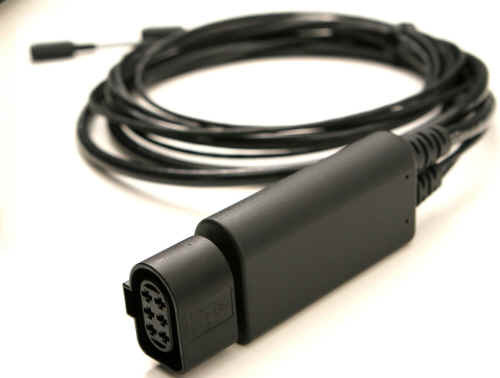 Aftermarket EFI Notes: While we recommend the use of Wide Band O2 sensor upgrades with aftermarket ECUs when this type of upgrade is available, most upgrades do not utilize this technology. The ability of the ECUs like the ThunderMax and Daytona Twin Tec to self-tune with their WBO2 sensors add-in can save riders money over the long term. Rather than having to pay for tuning when you make changes to your engine, you simply put the ECU into "self learn" mode and the fuel map can be updated. For fine tuning to maximize power, some dyno time may be needed. But the 4-6 hours required to create a custom fuel map from scratch is eliminated. Gear Drive cams are not required for the 06 Dyna's and 07 engines. HD has dramatically improved the cam drive mechanics. Performance Cylinder Head Upgrades While the SE cylinder heads can produce nice improvements in performance, Nightrider recommend the use of professionally ported heads from the aftermarket to maximize power capability. The top rated performance shops are constantly refining their product to improve power output. The best performance shops are able to get 100+HP and 100+ft.lb. torque from 95/96 cubic inch engines with 9.5:1 compression. This would translate to 110/110 from a 103CID engine and 120/120 from a 110CID. Nightrider recommend the use of professionally ported heads from the aftermarket to maximize power capability. A well configured and tuned 1200cc engine is capable of 100-110HP. Maximum Compression Ratio 9.5:1 compression ratio is recommend to prevent detonation and overheating that frequently occurs in the heavy FLH based bikes. A properly built 9.5:1 engine makes about 97% of the power of the higher compression engines. 9.5:1 compression is recommend for most bikes. Ratios up to 10.5:1 can be used when the top end of the engine is properly blueprinted. It is highly recommend that RPMs be kept above 2500 RPMs while riding to prevent detonation. Crankshaft Bearings 96 CID engines are known to have weak crankshaft bearings. For serious performance work these bearing must be replaced with the heavy duty bearings used in the CVO 110 engine. The 110 upgrade kit does not contain these bearings. Any 96CID based engine that is going to experience 'severe use' or is expected to produce over 110HP should consider this bearing upgrade. When the OEM bearings have a problem, the engine will experience a catastrophic failure. Hot exhaust and engine temperature The 2007 engines have a reputation for very hot exhaust systems. This problem is well documented for the 2007 FLH's, but does exist on all the bikes. All these bikes including the 2006 Dyna's are also know to have high operating temperatures and poor throttle response while cruising. This issue is directly related to the EFI closed loop operation mode at idle and cruising speeds. In closed loop mode, the narrow band O2 sensors used by the Delphi ECU hold the air fuel ratio at 14.6:1 which is good for EPA compliant emissions but creates a very hot exhaust pipe. Nightrider has a fix for this issue that will reduce the exhaust temperature, improve throttle response and increase HP. Nightrider.com's Patented XiED technology was designed to improve the closed loop fuel mixture on stock bikes and those with exhaust/air cleaner upgrades. Want to be able to accurately monitor the fuel ratio of your bike? The only way you can know for sure what the AFR your engine is running is by using a wide band O2 sensor. We have taken our LC-1 WBO2 technology and created an accurate monitoring upgrade for your bike. These kits will produce more accurate AFR readings than a Dyno sniffer because it determines the fuel mixture in the exhaust header, not the muffler where readings can be compromised because of air getting into the exhaust system. Here is a first look at the electronic control module used for the Nightrider wide band AFR gauge. The size of the main electronics module is 3.5"Lx1.5"Wx0.9"D and is intended to mount on the lower front frame or the seat of the bike. The upgrade will consist of the LC-1 electronic module, one WBO2 sensors, programming instructions for the LC-1, 1-LC1 to H-D wiring harness adapters and installation instructions to connect the upgrade to your motorcycle. No ECU upgrades or ECU programming required for HD/SE Stage 1 and Stage 2 upgraded engines. The upgrade is 100% compatible with any of the HD or SE ECU downloads, HD Stage 1/2 upgrades (96/103/110CID), is compatible with SERT/SEST/TTS for highly modified bikes and aftermarket EFI upgrades like PCIII/Fuel Pak/TFI. So no matter if you have a sport bike, import cruiser or american v-twin, the LC-1 WBO2 upgrade package will have a place in your performance plans. Copyright Nightrider.com Performance Products. All Rights Reserved. Nightrider is changing its distribution to Dealer Only. We will no longer be taking orders directly from consumers.